Garcia Promotions hosted their second Grappling Super Fights event Friday night, boasting a stacked card of 36 matches. There was plenty of action to be seen from the get go with the kids division, all four matches ending by way of submission. It’s inspiring to see young athletes take the stage and astonishing to see what they learn and can accomplish. Perhaps one of the most shocking matches occurred when returning GPSF competitor Eddie Pugachov, at first glance, caused his opponent, Nate Suarez, to pass out via triangle choke. Suarez regained consciousness and was able to walk away with little assistance, and received quite a bit of encouragement for fighting till he could no longer continue. Suarez’s father stated ‘Nasty Nate’ suffered a panic attack, and that was the reason for him passing out. Other returning competitors, like Streamline coach and black belt Dean Zaino, and Team Tooke’s Chris Wilemon, also found their way to submission victories to continue their streaks with GPSF. The draw of sub-only style events is that the athletes are expected to push the pace given they only have seven minutes (five minutes for kids and teens) to secure a win. Often times, this means the audience anticipates daring submission attempts and escapes. The match between Jose Martinez and Cameron Graves was one such example. 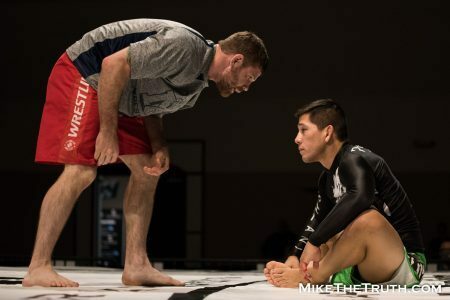 Graves pushed the pace early on, controlling positions and furiously hunting for a submission, but was edged out by the clock and Martinez’ defense. Despite a late night, the event was another success and the future looks promising. Garcia Promotions will be hosting Fury FC 11 on June 17, and GP Super Fights 3 on July 29. Below are the results and a link to the photo gallery.